What do you make of the following restaurant receipt? The diner left as tips. A few things conspire to make this a “cute” receipt. The amount of the dinner ($26.86) is such that when it is rounded up to the nearest ten, the difference is the common approximation of the number Pi (3.14). Maybe that dining experience happened on the 14th day of March or maybe not. However, the number Pi is in the news today (with today being March 14). This is a piece from CNN.com. This is a piece from Time.com. This is a mention of Pi from npr.org last year. The number Pi is purpose driven math, from mundane tasks such as building a dining room table to advanced calculation of orbits for space travel. In general, pi is used to study everything that cycles, e.g. movements that repeat at fixed intervals (think heart pulses and many periodic motions in the natural world). 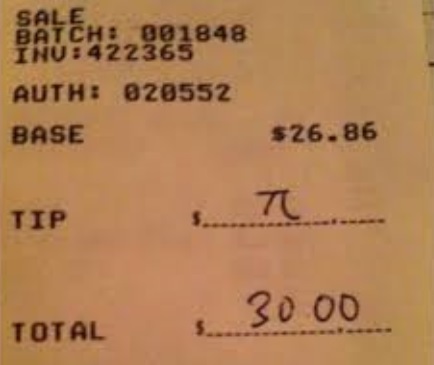 There are other uses of Pi that are less obvious. One is that Pi is used is used in testing computer precision. The other is that the digits of Pi are used as random numbers since they behave like random numbers. Here’s is a discussion of the digits of Pi as random numbers in a companion blog. Could Madoff be caught sooner?